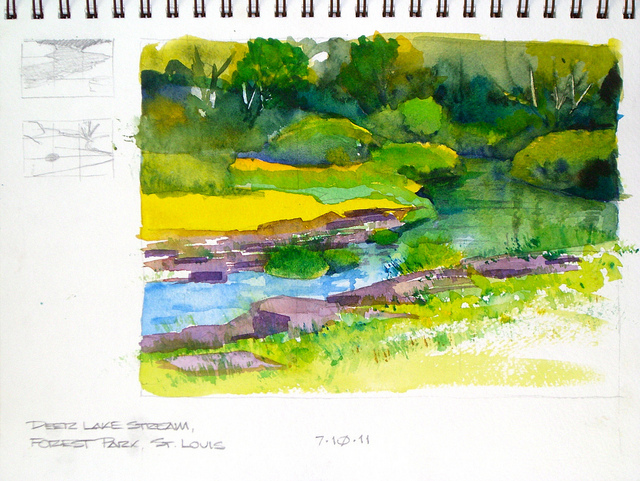 I sketched this plein air in a cool shady location in Forest Park, St. Louis. I've driven by this particular area of the park many times, but I never realized this little spot existed before today. There are a thousand paintings to be painted here--there is jaw-dropping scenery everywhere one looks. I enjoy painting plein air, but I haven't done much of it for a while, which added to the already inherant challenges with this scene. The scene was a "wall of green"--green everywhere I looked. So I abstracted the colors to break things up chromatically. Also, the scene was very complex, so I had to simplify things extensively. I'd like to practice more with this type of painting and hopefully I'll have more opportunities to do so this summer.